I’ve got an old Stanley #55 I’m working on. I’ve sharpened all the moulding knives, got the manual, still looking for a couple missing parts, etc. The plane body, originally nickel plated has some rust and some of the nickel plating has been lost. I’m interested in removing the rust and re-plating it. I’m going to handle the rust through electrolysis which I know will also remove the remaining nickel plating which I’m not concerned about since I’m going to replate it anyway. My question is, how do you remove the wood handles from the metal body of the plane? I can see a pin or rivot on one side of each handle but I’m not sure how to get the handles off without damaging them. Any thoughts or experience out there in doing this? 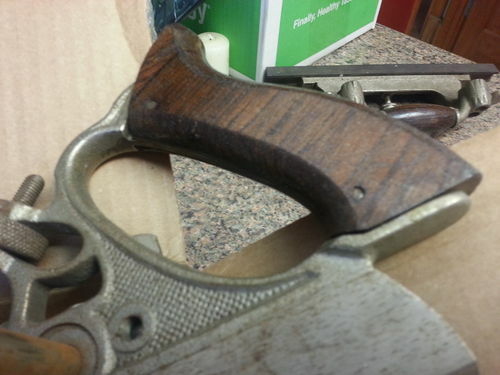 DonW here on LJs has removed the wood scales from a #45 and blogged about it, so you might search there or contact him. He is the Yoda of refurbs / restorations for sure. Looking forward to progress pics on your restoration! I’ve never done a #55, but some of the #45 have a similar set up. Those pins are compression fit part way into the other side of the handle. Getting that handle off intact is going to be a chore. On the one I did, the handle was shot, so I didn’t have to worry about it. The only possibility I can think of is drilling out the pin far enough to get to the back side of the metal handle. Those handles look pretty good I would leave them alone. If your trying to remove them so you can put some fresh nickel on the plane you may want to consider this product. 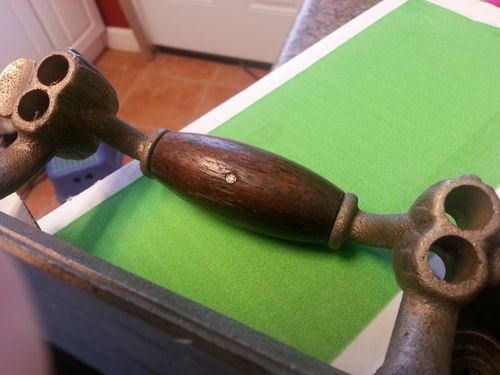 I bought it and it works OK on brass and copper and not so well on cast iron. There is a kit for flashing copper too. I bought it also, but have never gotten around to trying it. The plane needs to be super clean and if you want it have a mirror like finish you need to have it that smooth before you apply the nickel. Don’t worry too much about the soot that will come out with some metal polish. Well, after cleaning up the grime, dirt, etc., I decided I’m not going to have to re-plate it after all. It cleaned up really well. It’s not sparkling shiny brand new looking but there’s very little evidence of rust anymore. A little vinegar and some commercial rust remover with a soft wire brush by hand and a wire wheel in the drill press did wonders. I’ll post some pics later. My mission now is to acquire the missing parts : adjustable cam rest/stop, auxiliary center fence, and the adjustable beading stop/depth gauge. So, if any LJers out there have some spare parts they’d like to part with send me a message. I would love to see a pic of it cleaned up! I was thinking of nickeling mine. I wish some company would make reproduction cutters espiscally the special cutters. -- Focus on what you can do not what you can't do! There are companies that will do it, but it ain’t cheap. If I had more time I’d learn to do it myself.